New to the NOAC landscape this year was a Remote Delegate Program that allowed brothers to partake in the NOAC experience from afar. I chose to participate in this new adventure and this is my story. Nationwide saw 236 Brothers from 126 Lodges participate in this venture. Kittatinny had four participants; Tristan Keesey, Andrew Reilly, Barry Leister and myself. We were sent communication that explained how to access the conference and what would be available. Every Remote Delegate received a packet delivered by Fed-Ex. This packet contained our lanyard, sustainability water bottle, new OA handbook, drawstring pack and a special Remote Delegate patch. We had access to streaming presentations all week long. We could watch as little or as much as our schedule and preferences would allow. The morning and evening news shows were at our disposal. We also could watch each evening arena show, I even joined in on the pre-show singing of Sweet Caroline. I along with all the other Arrowmen were really impressed by Terry Fossum. I “sat” in on presentations that increased my knowledge of how Lodgemaster works. Seeing these presentations was all part of allowing me to earn my Maze Runner participation award. 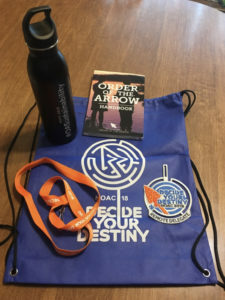 Earning this required me to watch the shows, the Sustainability panel, the Region Gathering, the ArrowCorp panel and tweet a photo of me using my sustainability bottle. I entered all I completed on a spreadsheet and submitted it to Andrew Miller, our national Remote Delegate liaison. I was able to drop in and watch some of the American Indian Dance competition one afternoon. Training sessions on Motivating Youth and Unit Elections were also at my fingertips. I listened to the Chief Scout Executive speak as well as our National Chief and Vice Chief. Sustainability was another interesting session I watched. The Thursday night Regional Gathering was fun to watch, and I also made sure to have some ice cream at the conclusion of the Closing Show. I was able to watch this and much more from my home on my iPhone, iPad and iMac. I even watched part of the Dance competition while waiting in my car for my grandson to be dismissed from his pre-school. I soon realized my granddaughter had been watching over my shoulder the whole time and her brother then joined us in watching this interesting presentation. My oldest grandson was an on-site delegate to NOAC 2018 and this program allowed me to sharethings with him and we have been able to talk about presentations and programs that we both experienced. An amazing thing happened between the Opening and Closing shows, some enterprising brothers started a Facebook page just for Remote Delegates. This served many purposes, one was to satisfy the Maze Runner requirement to engage with 10 other Remote Delegates and it allowed us to form a support group that kept us up to speed on program changes almost as soon as they occurred. Incredibly, someone hatched the idea that we needed our own flap. Within a short period of time a design was put forth and orders were taken. 475 flaps were sold quickly, and the group agreed that the estimated profit of $1679.00 would be donated to Camp Emerson and Philmont to assist in their recovery efforts this summer after the devastating wildfires. 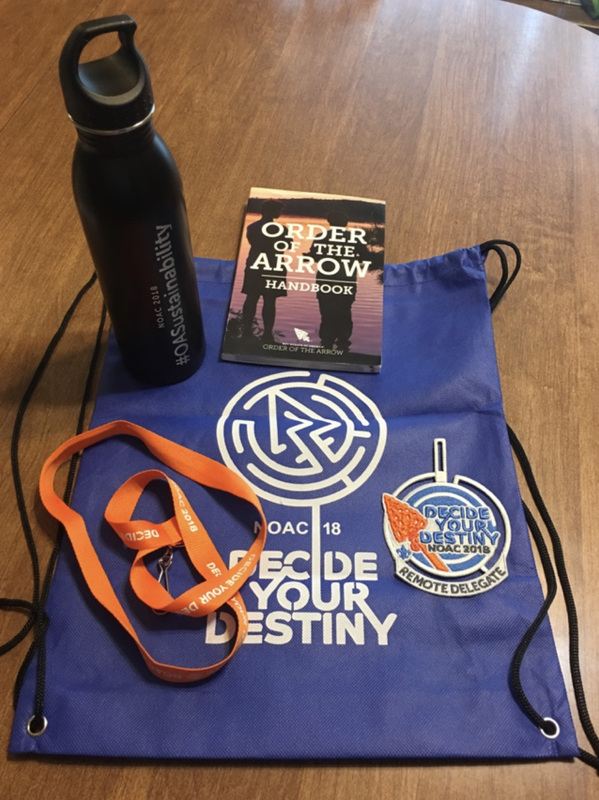 I’ve personally attended four National Order of the Arrow Conferences and this experience was well worth the time and effort. It allowed me to participate in more events than I could have in person. I could watch the sessions and shows live or later at my convenience. Plans are in the works to continue this at future NOAC’s. I recommend any brother not able to go to Michigan State in 2020 to become a Remote Delegate.